Can Antiobiotic Resistance be Spread by Wastewater Treatment Plants? On a warm, sunny day, there’s nothing more refreshing than pouring a glass of nice, cold water, right from the tap. You might even add a slice of lemon and voila, you have a tasty drink that’s healthy to boot. That is … as long as you have contaminant-free water. The scary thing is, many people don’t have their water tested regularly, especially if they live in a community served by municipal water sources. After all, the local authorities are responsible for ensuring the water is safe for public use and consumption, right? While this is generally true, it doesn’t always guarantee contaminant-free water. In fact, recent research indicates that small amounts of antibiotic resistant DNA have been discovered in the products of wastewater treatment plants. How do antibiotics reach wastewater treatment plants? If you’ve ever been to the doctor and been diagnosed with a bacterial infection, you’ve likely received a prescription for an antibiotic. These useful drugs help to kill bacteria, or at least slow their growth, giving you a little more sickness fighting power than your body has on its own. During the course of treatment, most of the medication is absorbed and used by your body, but small amounts of antibiotic are excreted through waste. These particles then make their way to wastewater treatment plants. Are antibiotics fully removed from waste water? At wastewater treatment plants, contaminated water is cleaned. This often includes a combination of filtration procedures and the use of microscopic bacteria that digest and eliminate waste products found in the water. When these bacteria encounter the “leftover” antibiotics that remain in the waste water, they develop resistance genes, which are then passed on to other bacteria cells. Over time, and as they continue to consume waste products, these bacteria grow in size and also reproduce. This forms what is known as biomass. Where does the biomass go? Most of the time, it is brought to the landfill or used in fertilizers. How does antibiotic resistant DNA get into drinking water? When antibiotic resistant bacteria are found in biomass, it’s easy to see how they can make their way into surrounding soils and eventually into the water supply. But biomass is not the only place that these bacteria are found outside the treatment plants. Sometimes, the antibiotic resistant bacteria also make it through the filtration systems at wastewater treatment facilities. They are then whisked away from the plant via the effluent, a fancy name for the water that leaves the facility after it has been treated or cleaned. This water is then used in a variety of ways – for irrigation, fighting fires, or replenishing groundwater supplies, just to name a few. Any of these uses can lead to water containing antibiotic resistant bacteria making its way into drinking water. Whether you have a personal well or rely on municipal water, it’s important to have your water tested periodically to make sure that it is contaminant free and safe to drink. For the ultimate protection, install a Rayne drinking water system and enjoy safe, great tasting water all year long. Then you can relax, pour a glass of water, and drink up! There’s a big push for equality in our country – equality between races, genders, social status, and so on. Does this same theme apply to water? Is all water created equal? We don’t think so! Sure, in its purest form, water is water, but once it comes in contact with people and the environment, everything changes. Water can easily become contaminated or hard. No, we’re not talking about ice here – that’s not the “hard” we’re referring to. In this scenario, it’s what’s IN the water that gives it this description. Hard water contains a buildup of minerals, such as calcium and magnesium, which has reached a certain level (greater than 3.5 grains per gallon). While it may not look much different than soft water, hard water can wreak havoc on homes and people, not to mention the household budget. How does water get softened? The solution to hard water is to install a water softener in the home. This is a device that attaches to the water supply and treats it right at the source. Salt-based water softeners introduce sodium into the water, attracting and removing the excess calcium and magnesium ions and thereby softening the water. There are also salt-free water softeners which use a magnetic or electrical current process to achieve the same end result, although they are generally considered more environmentally friendly. If you have hard water and don’t yet have a water softener, why not give us a call? We have both traditional salt-based water softeners and eco-friendly solutions such as Portable Exchange Tank Service. Your soft water, and all the benefits that come with it, are only a phone call away! If you have children in school, you’re likely familiar with the periodic report card coming home. Sometimes, this is the only way you know how your child is performing in school. It’s helpful in showing what your child does well, what she does poorly, and what improvements need to be made. A water test is like a report card for your water supply and can give you important insights into the safety and quality of your drinking water. What is a water test? Very simply, a water test measures the types and amounts of certain contaminates existing in your water supply. The various contaminants measured are determined by the type of test, who is doing the testing, and where your water supply is. If you live in a community where the water is provided via municipal sources, you may wonder why it’s necessary to have your water tested. Don’t governmental agencies do their own testing to ensure that they’re providing safe water to the public? The short answer is yes, they do. However, the required testing is not always done on time, and officials aren’t always quick to release the results, especially if they’re unsatisfactory. Play it safe and get your own water tested regularly. How often should I get a water test? 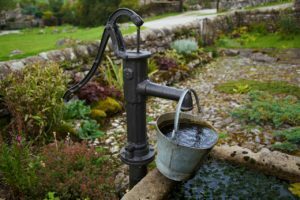 According to the National Ground Water Association, individuals with wells should get their water tested at least once a year. The test should look for bacteria, nitrates, or any other contaminant that is a concern in your location. For example, if E. coli was found in your neighbors’ wells, you might want to have your water tested for the same. While local agencies do undergo periodic testing of their water supplies, it certainly doesn’t hurt to get your own test done at least once a year if you’re relying on them for your water. If nothing else, it will provide you with peace of mind that you’re drinking safe, quality water. Of course, you should get a water test done sooner if you notice a change in the look or smell of your water – this is true regardless of the water source. Water tests can be done by local laboratories or agencies. 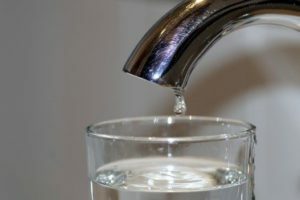 The homeowner is typically given instructions for the collection of a water sample, and the sample is then tested for the contaminants in question. This costs money, however, and accurate results hinge on accurate collection techniques. Rayne makes it easy – we offer a FREE water test completed by one of our knowledgeable technicians. When the results are in, we’ll even let you know if we recommend a home water treatment system or drinking water system to ensure you have the best water possible. Down With the Flu? Drinking Water May Help! It’s flu season, and with it comes lots of questions. What are the symptoms of the flu? How can I get over the flu faster? What should I eat and drink when I’m sick? Your doctor can give you detailed answers to all of these questions and more, but most health professionals will give you this advice: following healthy habits, such as drinking water, eating immune system boosting foods, and getting plenty of rest, can sometimes prevent sickness or at least lessen its duration and severity. One of the best ways to deal with the flu is to try to prevent it in the first place. While drinking water is not a guarantee that you won’t ever get sick, it is useful in keeping your body as healthy as possible. Water carries oxygen to cells, which then allows bodily functions to work properly. It also helps to promote healthy skin and flush away toxins, both of which can keep disease causing organisms from taking hold and wreaking havoc inside the body. If you’re unable to prevent the flu, drinking water might help lessen its severity. Symptoms associated with the flu may include fever, runny nose, vomiting, and diarrhea, all of which can increase the amount of water that your body loses. If these symptoms persist long enough, and if fluid intake is not increased to compensate for the loss, you can easily become dehydrated. Drinking plenty of good, quality water can help with these symptoms, as well as loosen mucus and relieve congestion. 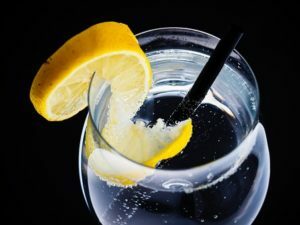 Whether you’re sick and trying to get proper hydration, or you’re healthy and just want to stay that way, you’re more likely to drink water if you have great tasting water at your fingertips. If your current water supply doesn’t taste so great, why wait to fix it? Schedule a free in home water test today, and find out how to great tasting water with Rayne. Then you’ll be able to enjoy tasty beverages every day, whether it’s your morning coffee, tea, juice or just a tall glass of water all by itself. It’s time to drink up and cheers to your health! Are California Wildfires Affecting Our Water Quality? Recent news has been full of pictures of the devastation caused by California wildfires. Area residents are left wondering if the fires will affect their water quality. When fires clear out large quantities of plants, there are fewer plants to absorb water, leading to an increased water supply. While this may be a benefit in some areas, it can lead to flooding in others. Additionally, the loss of plants and their roots that hold soil in place can result in erosion and excess sediment reaching our freshwater streams, lakes, and ponds. During active burning, fires can also leave a layer of ash on top of bodies of water – the ash can then find its way into the drinking water of both animals and humans. Post-fire runoff can also carry with it contaminants from other locations, especially in areas where urban developments have been burned. These contaminants eventually seep into groundwater which can then affect drinking water supply and water reserves used for agricultural purposes. 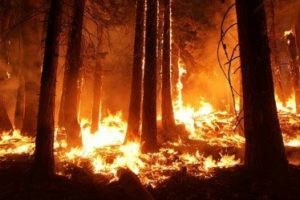 If you live in California, you’ve likely seen efforts by state and federal officials to prevent, or at least contain, wildfires to minimize their effect on human life. While these efforts are admirable, they often take time to implement and are typically out of the control of the average homeowner. There is something you can do, however, to at least protect the quality of your drinking water and the water you use on a daily basis in your home or business. Drinking water systems, including a whole house reverse osmosis system, can provide safe, healthy drinking water at every tap in your home. Give us a call today to find out which reverse osmosis system makes the most sense for your family and do your part to protect one of our most valuable resources. Eradicate Water Contaminants with Eco-Friendly Power! We want to shine a little spotlight on one of the most eco-friendly and effective drinking water systems available for your home – the Rayne Eradicator. 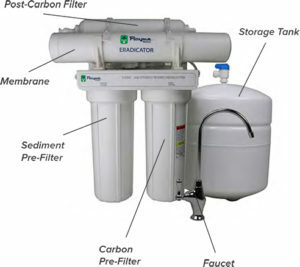 This is one of the leading products on the market today for removing drinking water contaminants. So many Americans take their tap water for granted – we know that the EPA does a pretty good job of regulating the water we drink. 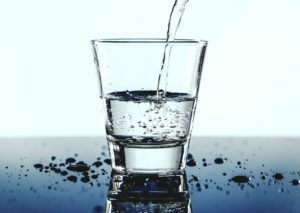 They require tests for over 90 contaminants, which is a good reason to not have to think about what is in your home’s drinking water. However, not ALL contaminants are tested for. Expecting a water treatment facility to monitor for thousands of chemicals, is just not practical, not to mention cost-prohibitive. If you worry that your water may have unregulated contaminats in it, we can help. This is where products like the Rayne Eradicator come into the picture. You don’t have to worry what contaminants could be finding their way into your tap. There are many avenues for contaminats to get into your water, but you only need ONE to keep them out – and that’s with one of our effective drinking water systems. The Rayne Eradicator is both economical and efficient, well worth the low monthly cost, but what sets this product apart from our competitors is that it is extremely eco-friendly as well. This innovative water treatment option uses 75-95% less water than traditional reverse osmosis systems! Not only does it alleviate the worry about potential contaminants, it also alleviates the concern about water usage as well. This is a huge advantage, especially here in California where water usage is closely monitored. We first introduced this product in 2017 and are excited to shine the spotlight on it today. With its special sediment filter, carbon and post-carbon filters and membrane, it is capable of providing superior water to your family without all the water usage of a typical reverse osmosis systems. Whatever filtered drinking water demands your household requires, the Rayne Eradicator is more than capable of meeting those needs. Learn more about this special, one-of-a-kind product here! Water conservation has long been a hot topic among environmentalists and politicians alike. This is especially true in California, where densely populated areas combined with adverse environmental conditions have made water scarcer than ever. It’s no surprise then, that the water conservation topic leads the headlines wherever you look. Over the last few years, many municipalities and water authorities have taken conservation efforts into their own hands and begun water saving programs to help make a difference. More recently, however, the state government has stepped in and passed new laws that make certain water saving measures mandatory, not optional. On a personal level, new California water conservation laws provide regulation regarding how many gallons of water each individual can use on a daily basis – the current goal is to reduce water usage to 55 gallons per person per day within the next few years, with another 5 gallon per day reduction coming in the future. In addition, outdoor water use by individuals and communities will be regulated. Regardless of how you feel about governmental control over such things, the bottom line is that water conservation affects us all and we should take it seriously. We believe water conservation efforts can start at home, and that includes what type of water softener you use. Traditional water softeners are salt-based and can be harmful to the environment due to salt contamination of waste water, leading many localities to enact water softener bans. 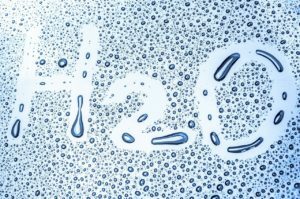 With much of California having hard water, however, there is still a high demand for water softening solutions. One remedy for hard water is a Portable Exchange (PE) Tank Service. Rayne technicians simply deliver tanks of soft water to your home or business with a frequency depending on your usage. The tanks do not require electricity or a drain, meaning no salty waste water gets discharged into the environment. When empty, the tanks are returned to a state-of-the-art facility where they are regenerated under controlled conditions. PE Tank Service is an excellent solution for not only preventing waste water contamination but also conserving water overall. Give us a call today to see if this service makes sense for your home or business and together, we can lead the water conservation efforts in our own communities. Whether it’s for drinking or for everyday household tasks, water is an integral part of our lives. Yet, there are many problems that can arise when trying to get and maintain the best water for you and your family. Here, we look at smart solutions for some of the most common home water problems. If you live in California or Arizona, you’re likely familiar with this common water problem, and it’s prevalent in other areas of the country as well. Left untreated, hard water can cause discoloration of fixtures and appliances, dull hair and skin issues, and spotting on dishes, among other problems. The easiest way to resolve hard water issues is to install a water softener. Since every home is different and every family has different needs, it’s important to talk to one of our experts to find out the best fit for your situation. If you see orange colored stains on washed clothing, or rusty residue on fixtures such as sinks, toilets, and baths, your water likely has a high iron content. This not only affects the appearance of whatever it touches but can also cause permanent damage to water-using appliances such as dishwashers. Solve this nuisance by installing a whole house water conditioner which helps to reduce heavy metals and protect appliances. There’s nothing pleasant about pouring a glass of water, expecting a refreshing drink, and being turned off by the taste or foul smell. Since this can be caused by many different sources, it’s important to have a professional water test done to determine the root of the problem. An easy fix in most cases is the purchase and installation of a Reverse Osmosis drinking water system, leaving you with great tasting water that is safe to drink and free of contaminants. If you live in an area with a water softener ban, yet you have hard water or another water problem listed above, a smart alternative to a softener is our Portable Exchange (PE) Tank Service. Our technicians simply bring tanks of softened water to your home at predetermined intervals with no maintenance, materials, or electricity needed. No matter what water problem your home is plagued with, we have a solution that can help. Give us a call today to schedule a free water test and we’ll soon have you hooked up with the best water treatment solution to meet your needs. California schools can have their drinking water tested for lead for free … so why aren’t many schools getting the tests done? According to a recent article in the San Francisco Chronicle two-thirds of the state’s 1,026 school districts have not taken advantage of a free … yes free … state testing program to determine whether lead is coming out of the taps. We obviously want our children to be safe in school; and while there’s plenty to worry about these days, the quality of drinking water should not one of them. Why is this a significant issue for parents to be concerned about? Well, exposure to high levels of lead can cause irreversible neurological and brain damage, including lowering a child’s IQ. There’s a continued urgency to instill healthy habits in our children. One of the most important being that they drink more water throughout the day. But how can we encourage our children to stop at the water fountains in school if the drinking water could contain lead? It’s been reported that some California schools have even had to close off their water fountains due to known lead contamination. If your school has had lead in their drinking in the past or has not recently tested their water for lead, you may want to start the year off by taking matters into your own hands. Make sure they have plenty of lead free drinking water available to them. It’s easier to do than you may think! Buying and sending your students off with bottled water is not the answer. While this might seem like a simple solution, this will likely lead to toxic plastic waste not properly being recycled. Some schools don’t have recycling programs and even if they do, many water bottles still end up in the garbage. Instead, consider installing a home drinking water system which can filter your home’s tap water. Not only will you be assured that your home drinking water is free of lead, your children will have access to lead free drinking water to take to school. Just send them with a reusable water bottle filled with safe high-quality drinking water they will be able to drink throughout the day. Parenting is hard. Being a kid is hard. Knowing what is in your child’s drinking water doesn’t have to be hard. We make it easy. Give us a call and start enjoying water that you KNOW is safe for your family. This is the Month for Drinking Water Safety! Now is a great time think about the drinking water quality in your home. Have you ever considered what could be in your tap water and the potential contaminants you could be consuming? There’s no doubt that this country has some of the best drinking water in the world. But even here, we have issues and contamination that we may not even know about. Groundwater pollution, pesticides, chemicals and agricultural runoff, along with old water treatment facilities losing their effectiveness at filtering our drinking water, is causing drinking water all around the country to be compromised. This month, how about thinking about installing a home drinking water system to relieve you of any contamination concerns? There are 100’s of reasons to filter your home’s drinking water. The Environmental Protection Agency currently has set regulations for over 100 contaminants, but there are another 100 or so that are not even regulated. California is having a drinking water crisis – no, not just the drought – where rural communities and almost 1 million people are drinking water that is not up to par and is loaded with contaminates. Now is the perfect time to read that water quality report that your municipality sends you. It’s important to educate yourself on where your home’s drinking water comes from and to learn about the potential contaminants in your drinking water. After that, you need to investigate the advantages (and pure necessity it seems these days) of a home water filter or other drinking water system to remove potential or present contaminants. You want your tap water to be as safe and contaminate free as possible for you and your family. Our products are eco-friendly and affordable – two reasons you need to stop waiting and start browsing. When it comes to our water quality we can be responsible and part of the solution too! Water "Spots" is an educational service provided by Rayne Water Corporation to help consumers stay informed about the water they use in their homes. It includes the latest water news and information as well as links to current water events.